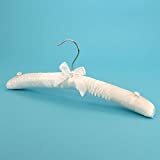 Pack of 3 Gorgeous Soft White Satin Padded Coat Hangers – 38cm wide . Comes packaged in sealed, clear pack. Premium quality – soft satin cushioning with strengthened inner wooden bar & swivel hook. Pretty central ribbon trim. White satin covered buttons on shoulders to secure straps, loops etc. Ideal as a gift or to give your wardrobe a fresh, luxurious look. Also listed in 38cm pink and matching children’s size at 30cm in Pink & black. This entry was posted in Wedding Store and tagged 38cm, Chrome, Clothes, Hangers, Hangerworld, Hook, Pack, Padded, Quality, satin, White by Formal Affair. Bookmark the permalink.